World Muslims and non-Muslims must celebrate 12th Rabi’ul Awwal, 1433 – 5th February, 2012 – as World Day of Qur’an for Universal Male-Female Literacy. And they must do the same thing consistently every year thereafter – on every 12th Rabiul Awwal. And there is a simple and yet a most powerful and convincing reason for doing so: Because it was the Qur’an that first called for universal male-female literacy. The Qur’an did so 1400 years ago – by asking everyone everywhere, male as well as female, to read. That is one of the greatest miracles of the Qur’an – and the very first one, if you look at it that way. And the Qur’an has been keeping up that drumbeat, that perpetual universal call for male as well as female literacy, nonstop ever since – for all these 1400 years. There is no doubt that the world has made great progress in that regard since then – absolutely, not a doubt about that. May God bless his world! But at the same time, it is also true that much progress remains to be made; especially where Muslims are concerned; and especially where women are concerned; both Muslim and non-Muslim; and much more so in the case of Muslim females. The real tragedy of Muslim Afghanistan is not that the Soviets and the Americans invaded and occupied it in quick succession, and laid it waste, and savaged and butchered its people, all of which are heartbreaking tragedies of course. The real tragedy of Muslim Afghanistan is that the bulk of the Muslim population of Afghanistan, male as well as female, remained mired in illiteracy, for decades, if not centuries – and no one did anything about it. Not a squeak or whimper escaped the mouth of anyone anywhere – Muslim or non-Muslim. What everyone seems to forget is that universal male-female education is our game: It is a Muslim game. We invented it; and yet we are lagging behind. Other teams are beating us, on home court – in our own game. So it stands to reason that we must now go full-court press and redouble our efforts in the field of education and literacy – for men as well as women. And we must do so in all parts of the world. And if you consider it seriously, there is no better day for the world Muslims, and non-Muslims, to launch a whole new campaign for universal male-female education and literacy than coming 12th Rabi’ul Awwal, 1433 Hijri – 5th February, 2012. That is the day associated with the noble birth of Prophet Muhammad, Sallallahu Alaihi wa Sallam. It is the day that Muslims around the world honor, revere and celebrate in different ways as Maulid-un-Nabiy: Birthday of the Prophet, Sallallahu Alaihi wa Sallam. And it is Prophet Muhammad, Sallallahu Alaihi wa Sallam, to whom God Almighty gave the Qur’an. And it is the noble Qur’an in which the very first commandment to both men and women from God Almighty – the very first revelation to Prophet Muhammad, Sallallahu Alaihi wa Sallam – was: Read! And Muslims being, maybe, over one-fifth of the population of the world, it makes perfect sense for the United Nations, Organization of Islamic Conference/ Countries/ Cooperation (OIC)/ Whatever, Organization of African Unity (OAU), UNESCO, United Nations Alliance of Civilizations (UNAOC) and other world bodies and organizations to adopt and declare 12th Rabi’ul Awwal, 1433 – 5th February, 2012 – as World Day of Qur’an for Universal Male-Female Literacy. And do so every year thereafter – every 12th of Rabi’ul Awwal. As for Muslim governments and societies throughout the world, from Morocco to Malaysia, and everyone in between, what prevents them from declaring 12th Rabi’ul Awwal, 1433 – 5th February, 2012 –as World Day of Qur’an for Universal Male-Female Literacy? And repeat the same thing every year after that – every 12th of Rabi’ul Awwal? Can you imagine what a glorious celebration that would be? And what wonderful benefits it would bring to the whole world in terms of culture, education, progress – and universal literacy – for females as well as males? Come on, let us face it! Muslim individuals and governments today control trillions upon trillions of dollars of wealth. I don’t want to go into details, but take it from me they do. So, here is what I propose super-rich Muslim individuals and societies of the world do: Regardless of what else they do or don’t do with their money, much of it stolen from their fellow-Muslims, it is time for them to take out a trillion or two of that money – not billion, but trillion – and devote it to take the message of the Qur’an to every home and heart everywhere. That way, I say to them, you get to keep the rest of your trillions – and continue to use them, as always, for your personal profligacy and for such social purposes, that you have long been using them for, as killing fellow-Muslims; destroying Muslim societies; and perpetuating all forms of tyranny over the minds and bodies of the world. That is so far as this world is concerned. As for the Day of Judgment, in the next world, there I suspect you are on your own. Your God there may, and the expectation is that he will, ask you to render a complete account of every penny you ever possessed: How and from where you got it; and how and in doing what you spent it. That is why I am hereby asking the super-rich individuals and societies among Muslims to repent, while there is still time, and to turn to God, and to return the wealth they stole from God and his people to God and his people. And they can all start doing this by celebrating 12th Rabi’ul Awwal, 1433 – 5th February, 2012 – as World Day of Qur’an for Universal Male-Female Literacy, and doing it every year thereafter. To the Muslims of the world – and to non-Muslims as well – I have one simple thing to say: It is time to make the goal of Universal Male-Female Literacy a done deal. No more ifs and no more buts. Let us just go ahead and get the job done: starting with our first celebration of the World Day of Qur’an this coming 12th Rabi’ual Awwal, 1433 – 5th February, 2012 – and every year thereafter. 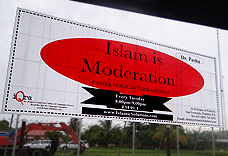 [PRESS RELEASE] Dr. Pasha Calls for World Day of Qur’an for Universal Male-Female Literacy!